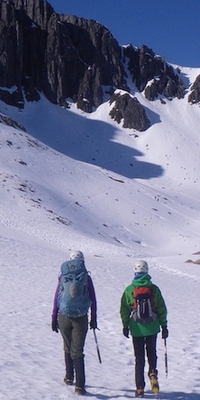 At Alpha Mountaineering we offer all aspects of mountaineering in the Scottish hills. We provide instruction and guiding on hill walking, scrambling and climbing courses. We are regularly out mountaineering across Scotland in summer and winter. Whether you want to learn to navigate, climb a sea stack or use ice axes for the first time we can teach you the skills you need. If you can't find what you're looking for on the site then feel free to get in touch. Photos by Nick Carter unless otherwise stated.